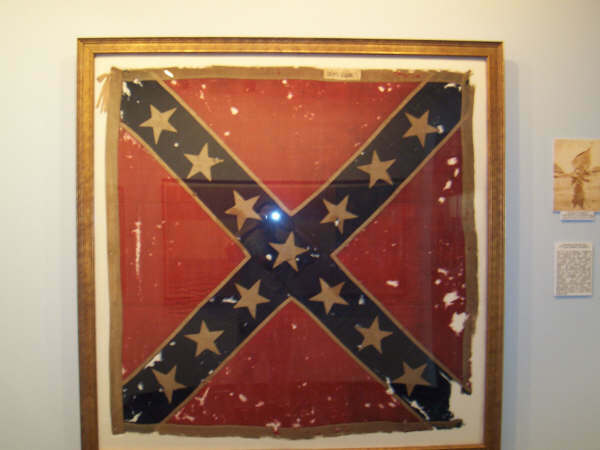 Photographed by the writer, all photos Courtesy Texas Civil War Museum. At Chickamauga, Ector's brigade suffered more than 400 casualties. Matthew Duncan Ector (1822-1879): Born in Putnam County, Georgia, February 28, 1822; Member of Georgia state legislature; Member of Texas state legislature, 1855; General in the Confederate Army during the Civil War (Ector had a below-the-knee amputation of his left leg at the Battle of Chickamauga); Judge, Texas Court of Appeals, 1866-1879; Died October 29, 1879; Buried at Greenwood Cemetery, Marshall, Texas. 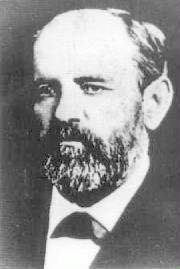 Ector County, Texas, is named in honor of General Ector. Ector's Brigade. 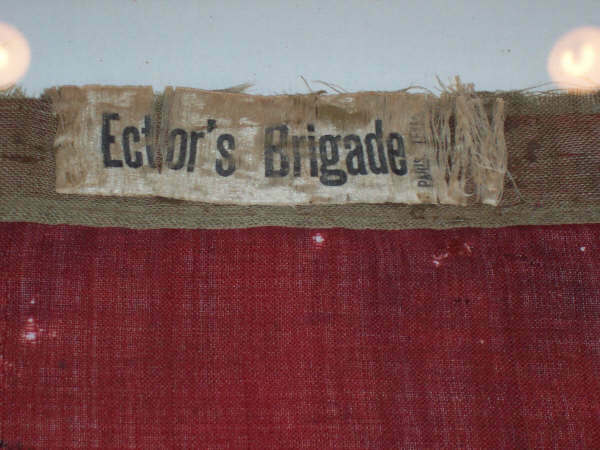 Ector's Brigade was formed during the reorganization of Gen. Braxton Bragg's command in November 1862, which resulted in the Army of Tennessee. Gen. Mathew D. Ector was the original commander of this Civil War brigade and served until he was wounded in July 1864. Other commanders were Gen. William H. Young, Col. C. R. Earp, Col. David Coleman, and Col. Julius Andrews. The original units of the brigade were the Tenth, Eleventh, and Fourteenth Texas Dismounted Cavalry, and the Douglas Battery. The Fifteenth Texas Dismounted Cavalry (the Thirty-second Texas Cavalry) joined the brigade soon after it was formed. The Eleventh Texas Cavalry, commanded by Col. William C. Young, was remounted after the battle of Murfreesboro, and its place in line was taken by the Ninth Texas Infantry. The Douglas Battery also left the brigade in early 1863. The Twenty-ninth and Thirty-ninth North Carolina Infantry regiments were transferred to the brigade in August 1863 and May 1864, respectively, and remained with it until the end of the war. Units that served briefly in the brigade were the Fortieth Alabama Sharpshooters, the Forty-third Mississippi Sharpshooters, and McNally's Arkansas Battery. Ector's Brigade participated in the battle of Murfreesboro, Tennessee, and took part in the initial assault on the Union right on the morning of December 31, 1862. In one day of fighting the brigade suffered 38 killed and 308 wounded. They did not take part in the fighting on January 2, 1863. The brigade marched to Mississippi and joined Gen. Joseph E. Johnston's forces in an attempt to relieve the besieged Confederates at Vicksburg. After the surrender of that city they participated in the siege of Jackson (July 10-17), before returning to the Army of Tennessee and fighting in the battle of Chickamauga, Georgia, on September 19-20, 1863. At this battle the brigade suffered 59 killed, 239 wounded, and 138 missing. In September 1863, Ector was again ordered to march his brigade to Mississippi, and after reaching General Johnston's army it joined Gen. Samuel French's division in the Army of Mississippi. After Johnston assumed command of the Army of Tennessee, Gen. Leonidas Polk took command of the Mississippi army and assembled his forces at Meridian to contest Gen. William T. Sherman's. When the federals moved, Polk transferred his troops to Demopolis, Alabama, where they remained until they joined the Army of Tennessee in Georgia in May 1864. Ector's brigade reached Rome, Georgia, in time to defend the town from Union troops on May 16 before joining Johnston's army at Kingston, Georgia. It participated in the long retreat toward Atlanta, taking part in numerous skirmishes and being lightly engaged at Dallas (May 25-June 4) before seeing action at the Lattermoure House and then at Kennesaw Mountain on June 25 and Smyrna on July 2-5. After Gen. John Bell Hood took command of the Army of Tennessee on July 17, Ector's troops remained in their trenches at Atlanta until they were lightly engaged in the battle of Peach Tree Creek on July 20. Once Hood had abandoned Atlanta, French's division was ordered to attack the federals at Allatoona, Georgia, where Ector's brigade saw heavy fighting. As a result of this action the brigade had forty-three killed, 147 wounded, and eleven missing out of about 400 troops and did not reach Hood's army until after the Battle of Franklin on November 30, 1864. Ector's brigade marched north with the Army of Tennessee and participated in the battle of Nashville (December 15-16) before retreating to Mississippi. During the retreat the brigade formed part of the rear guard that ambushed a federal force at Sugar Creek on Christmas Day. After General Johnston resumed command of the Army of Tennessee, Ector's Brigade was detached and ordered to Mobile, Alabama, where it joined other Confederate soldiers defending Spanish Fort (March 27-April 8, 1865). It was forced to evacuate the city and finally surrendered at Meridian, Mississippi, on May 4, 1865. Recommended Reading: Ector's Texas Brigade and the Army of Tennessee 1862-1865 (Hardcover). Description: Ector's Texas Brigade served most of the Civil War with the Army of Tennessee. With that battle-riddled command, they wrote an illustrious history upon the pages of American history. "A must read for the student of Texas history, the individual interested in the contributions of Texas in the Civil War, and for that buff that is remotely interested in the Army of Tennessee...[N]o serious study of Texas and the Civil War is possible without this volume." Editor's Pick: CIVIL WAR IN WEST SLIP CASES: From Stones River to Chattanooga [BOX SET], by Peter Cozzens (1528 pages) (University of Illinois Press). Description: This trilogy very competently fills in much needed analysis and detail on the critical Civil War battles of Stones River, Chickamauga and Chattanooga. "Cozzens comprehensive study of these three great battles has set a new standard in Civil War studies....the research, detail and accuracy are first-rate." Continued below. "...Mr. Cozzens' has delivered a very valuable, enjoyable work deserving of attention. The art work by Keith Rocco is also a nice touch, effecting, without sentimentality...historical art which contributes to the whole..."
Recommended Reading: Six Armies in Tennessee: The Chickamauga and Chattanooga Campaigns (Great Campaigns of the Civil War). Description: When Vicksburg fell to Union forces under General Grant in July 1863, the balance turned against the Confederacy in the trans-Appalachian theater. The Federal success along the river opened the way for advances into central and eastern Tennessee, which culminated in the bloody battle of Chickamauga and then a struggle for Chattanooga. Chickamauga is usually counted as a Confederate victory, albeit a costly one. Continued below. Recommended Reading: Advance And Retreat: Personal Experiences In The United States And Confederate States Armies, by General John Bell Hood. Description: When John Bell Hood entered into the services of the Confederate Army, he was 29 years old, a handsome man and courageous soldier, loyal to the ideal of Confederate Independence and eager to fight for it. He led his men bravely into the battles of Second Manassas, Gaines’s Mill, Sharpsburg, Fredericksburg, Gettysburg, and Chickamauga. He rose fast, attaining the temporary rank of full general, only to fall faster. Hood emerged from the war with his left arm shattered and useless, his right leg missing, his face aged far beyond his 33 years, and with his military reputation in disgrace. Continued below. Blamed by contemporaries for contributing to the defeat of his beloved Confederacy, Hood struggled to refute their accusations. His most vehement critic, General Johnston, charged Hood with insubordination while serving under him and, after succeeding him in command, of recklessly leading Confederate troops to their “slaughter” and “useless butchery.” Sherman, too, in his Memoirs took a harsh view of Hood. Born of controversy, Advance and Retreat is of course a highly controversial book. It is also full of invaluable information and insights into the retreat from Dalton in early 1864, the fighting around Atlanta, and the disastrous Tennessee Campaign in winter of that year. Far from being a careful, sober, objective account, this book is the passionate, bitter attempt of a soldier to rebut history’s judgment of himself as general and man. Recommended Reading: The Flags of the Confederacy: An Illustrated History. Description: Devereaux D. Cannon is an expert on vexillology (the study of flags). This book offers a history, profiles, design specifications and an overview of the various flags (national flags, battle flags and naval ensigns) that were utilized by the Confederacy. The book features several pages with glossy photos of the various flags of the Confederacy. It features even the little known flags. Continued below. Cannon's book has inspired flag makers to revive the old flags in addition to the 3 national flags, the battle flag and the naval ensign. This book is must have for flag gurus, Civil War buffs and southern partisans. BIBLIOGRAPHY: Biographical Encyclopedia of Texas (New York: Southern, 1880); Zachary T. Fulmore, History and Geography of Texas As Told in County Names (Austin: Steck, 1915; facsimile, 1935); Sidney S. Johnson, Texans Who Wore the Gray (Tyler, Texas, 1907); Southern Home Magazine, August 1897; Ezra J. Warner, Generals in Gray (Baton Rouge: Louisiana State University Press, 1959); Dorman H. Winfrey, A History of Rusk County (Waco: Texian, 1961); Official Records of the Union and Confederate Armies; David V. Stroud, Handbook of Texas Online.